The Drag equation calculator helps you compute a force exerted on a moving object immersed in a fluid. Reading the text below you will discover what the equation for drag force is, how the shape of the object influences the force and what the drag coefficient is. Fd is the drag force. The reference area A for an object of a simple shape is the cross-sectional area orthogonal to the direction of the motion. For example, for a sphere of radius r, we would simply take A = π * r². For an object of a more complicated shape, like a car, the reference area is more difficult to specify, but usually, it's larger than the cross-sectional area. For an application of the drag force, you can check the free fall with air resistance calculator and the Stokes' law calculator. The drag force equation depends on drag coefficient Cd. What is this? The drag coefficient is a dimensionless number that depends on the shape of the object. If an object has a smooth shape, then Cd is a small number and the resulting drag force is small as well. For example, it's equal to 0.04 for a streamlined body, whereas equals 1.05 for a cube. The drag coefficient itself depends on the Reynolds number Re. For small enough Reynolds number (of the order of few thousands or smaller) the dependence is mild and the drag coefficient is approximately constant. Check the Reynolds number calculator to learn more about different types of flows and their classification with Reynolds number. 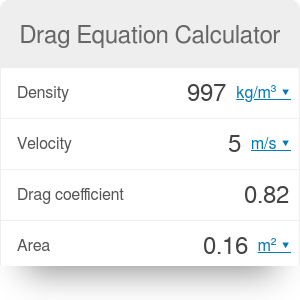 How to use our drag equation calculator? Simply choose a liquid, immersed object and the relative velocity between them. For example for an olive oil the density ρ = 920 kg/m³, with an immersed long cylinder (Cd = 0.82) with cross section A = 1 cm² and the relative velocity u = 0.3 m/s the resulting drag force is Fd = 1.358 N.
Drag Equation Calculator can be embedded on your website to enrich the content you wrote and make it easier for your visitors to understand your message.